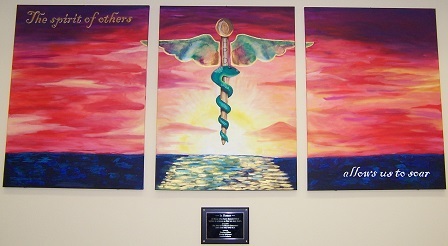 "HPD Caduesus Triptych : the spirit of others allows us to soar" by Heather Mikes, Wendy Ballenger et al. Mikes, Heather; Ballenger, Wendy; and Lofgren, Jessica, "HPD Caduesus Triptych : the spirit of others allows us to soar" (2007). HPD Library Images: Artwork displayed at the NSU HPD Library. 4.
bodies to science so that we may learn.